Call 866-869-3335 To Get the Right Life Insurance Protection For You at the Lowest Cost! Buying North Carolina life insurance is not one of the most exciting purchases for many. It’s hard to think about and often times put off… in many cases put off too long. As we grow older, we obviously get closer to death. Health conditions may arise as we age and make it more difficult and costly to get life insurance protection. That’s why it is wise to get North Carolina Life Insurance protection as early in age as possible. And since we can’t turn back the clock, now is the time to make sure you get lowest North Carolina life insurance quotes for your family and your loved ones are protected in case something happens to you. It is easier than ever to get life insurance protection from Paramount Insurance Agency. We offer multiple types of coverage from over a 100 life insurance companies. We can help you decide on the right type of policy and coverage amount for as long as you will need it. Plus, we’ll help you find the lowest cost North Carolina life insurance policy available. Whether it’s term or permanent life insurance coverage, we have the lowest rates that you’ll be able to live with. So, what kind of North Carolina life insurance do you need and how much coverage? There are many factors used to determine these 2 very important life insurance questions. Do you need permanent coverage such as whole life insurance, variable life insurance or universal life insurance that can build value as well as provide a death benefit? Or do you only need term life insurance that is lower in cost but provides a death benefit for a specified term without building cash value? And another big question is how much North Carolina life insurance coverage do you need? Finally! One agency that can shop the top North Carolina life insurance companies for you giving you the lowest rates from A+ rated life insurance companies. With just one phone call and in 5 minutes or less, we can give you the best quotes from the top North Carolina life insurance carriers. 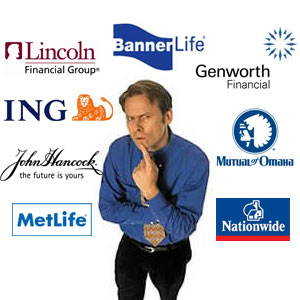 Our state of the art rating system will quickly rate over 100 life insurance companies including Banner Life, Met Life, Prudential, Transamerica, Principal Financial, Nationwide, John Hancock Financial, Lincoln Financial, AXA Financial, Aviva Life and Annuity Company, American General, Genworth Financial, Mutual of Omaha, West Coast Life and more. Whether you are looking for term life insurance, whole life insurance, universal life insurance, variable life insurance or survivorship life insurance, you’ve come to the right place. One of our friendly North Carolina licensed life insurance agents can help you find the right life insurance policy for your needs at a rate you can live with! For a free, no obligation quote and to discuss your life insurance needs, give us a call today. In just a few minutes, you’ll have the lowest quote for the right protection for you. Plus, we can even take your pre-application over the phone to get you covered in the shortest time. Paramount Insurance is your local independent insurance agency offering term, permanent and variable life insurance. We help families and businesses all over North Carolina from Winston Salem, Greensboro, High Point, Raleigh, Wilmington and Charlotte get the right life insurance protection at the lowest cost. Call for a free life insurance quote today!